I’m done! I’m done! I finished packing everything up at 3 this morning. It is all ready to be shipped or handed over. Get it away from me! So let’s get rolling here as I don’t have a lot of time. I make truffles about once or twice a year. I really dig the Robert Linxe truffles that Deb blogged about because I love to NOT temper my chocolate. But I like variety, and so this year I decided to enrobe truffles… in tempered chocolate… which I hate to do. Idiot, am I. Some folks say use good chocolate, others say it doesn’t matter. I say it matters like hell. Why? Well, I can taste the difference between Valrhona and Callebaut and Ghirardelli and Guittard and Nestles… And if I don’t like the quality of the chocolate, I’m certainly not going to give it out to people with my name stamped on it – sort of like my photography, sort of like my pottery, sort of like everything. No half-assedness allowed! 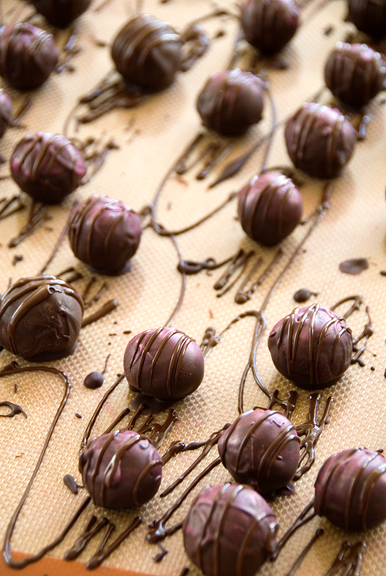 When making truffles, it’s the chocolate that is front and center. Make it count. What I love about truffles – what I think anyone who makes truffles loves about truffles – is the magical transformation from what looks like a terrible mess (hot cream flecked with bits of chocolate) into a silky, dark, velvety chocolate ganache. Have faith, keep stirring, it will come. Well, as expected, something had to give. My brain. Too many sweets in production at once is a guarantee for a slip up. I was thinking of the chocolate to cream ratio and did a 1:1 (which is a glaze) instead of 2:1 (for ganache). Durrrrrr. I had a pound of Callebaut (64%) and 2 cups of hot cream. 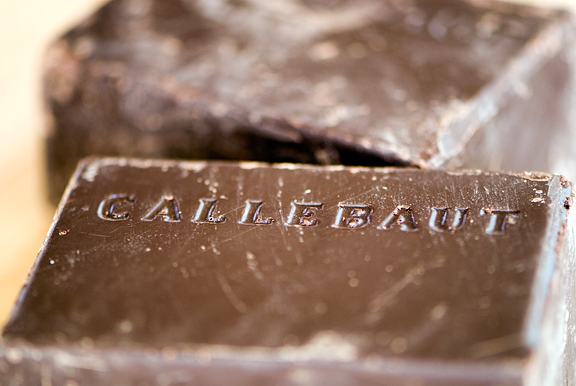 Luckily, I had another pound of Callebaut (64%) intended for enrobing. I quickly chopped that up and added it to my mix. I used the guidelines from my pastry skills course last year. Somewhere in my notes, I had scribbled: use 4 tbsps Grand Marnier for every 2.5 pounds of chocolate. I poured in 4 tablespoons of Grand Marnier and honestly could not taste it *anywhere*. I poured in 2 more tablespoons. Very faint. I wanted to add more, but the thought of somehow tanking the ganache by pouring in a whole bottle of Grand Marnier (and it was a big bottle) – two whole pounds of Callebaut… I chickened out and held off. 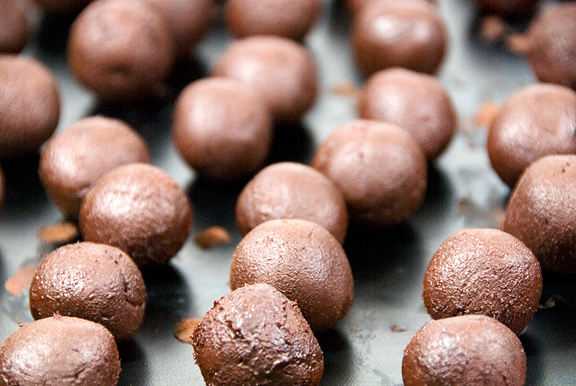 When the ganache had cooled and solidified, I scooped out and rolled… about 180 truffles. That was a lot. I would have been happy with 90, but that’s what happens when the brain goes on momentary vacay. That was day 1. On day 2, I prepared myself to enrobe the truffles. Enrobing is something I really dread because I am not a temper master and I hate to ruin a temper when using good chocolate. I was out of Callebaut, but I always have an emergency stash of Valrhona (I mean, I don’t now, but I’m going out to replenish it shortly). 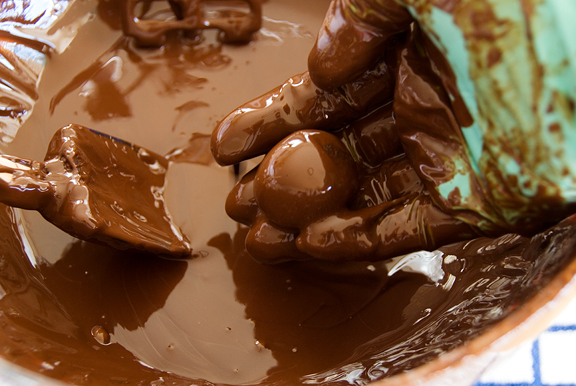 In general, it is really hard to work with less than one pound of chocolate when tempering. 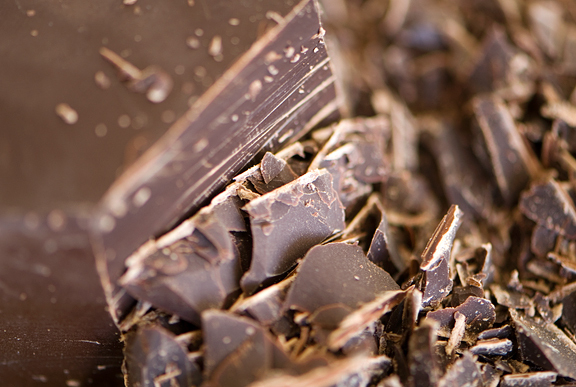 The more chocolate you have, the better the heat capacity. Tempering chocolate is maddening and I’m not going to go into all of the details and ins and outs because I am not an expert. I have about a 50% success rate with tempering chocolate and this time was no exception. There are better tutorials out there if you want to know how to do it right. I personally like the seeding method because it’s easier and because I need all the help I can get. I melted the chocolate over a water bath and removed it from the bath the moment the temperature reached 118°F. Take care to never ever never ever NEVER let a drop of water touch your chocolate. It will seize, it will not temper, and you will have to start over again with new chocolate. I set my bowl over ice packs and stir it (trying not to introduce air bubbles) while watching the temperature drop. 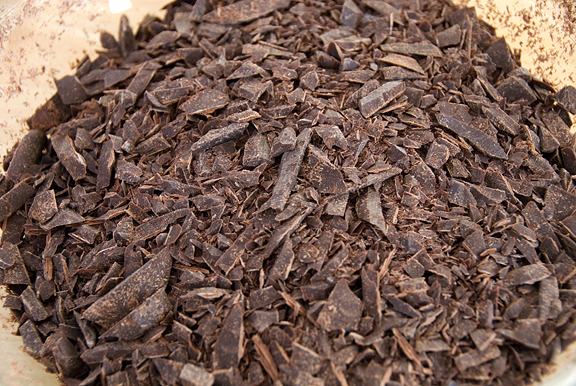 When the temperature reaches 95°F, it is time to seed the chocolate by tossing in a few pieces of tempered chocolate. The compound chocolate you started with is tempered (I reserve a few large pieces for seeding). At this point, stir and agitate the melted chocolate down to 89-91°F. The agitation is important to promote beta crystal formation. Don’t ask, just do it. 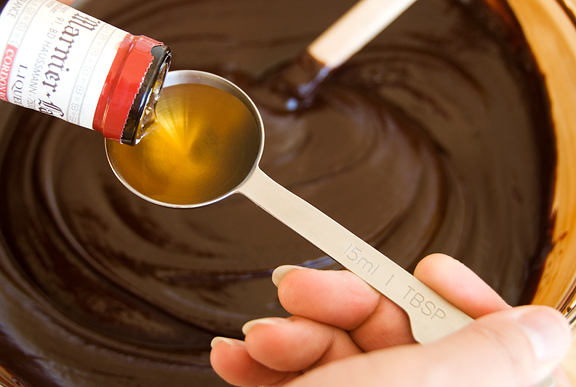 When the chocolate reaches that target range, you can do a test swatch and dip the back of a spoon in the chocolate and let it cool. When it cools, if it is shiny – it’s in temper. If it’s streaked, gray, grainy – it’s not in temper. With chocolate in temper, I will start to enrobe the ganache (at room temperature is best to avoid cracking). You need to work quickly. I dump three ganache balls into the chocolate (don’t add too many or else the temperature of the chocolate will drop too quickly). I grab the first and make sure it is coated completely, then shake out excess chocolate by hitting my hand against the side of the bowl. I roll it onto a silpat (next time I’m using parchment) and then repeat with the other two while replacing each truffle that is removed with a new ganache ball (using my other hand). It’s messy. 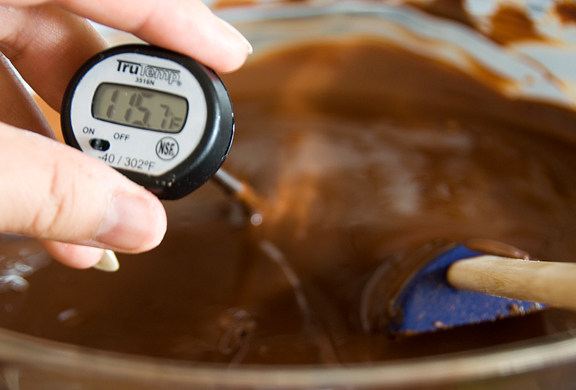 And while all of that is going on and chocolate is flying around, you need to continue to monitor the temperature of the chocolate. My digital thermometer dropped into the chocolate FOUR TIMES. So annoying. When the temperature begins to drop too low, I set the bowl over a pot of warm water. If the water is too hot, I will layer some towels in between the pot and the bowl or just remove the bowl from the pot. There is much to keep track of and it is especially stressful when your hands are covered in chocolate and the dog is just waiting for something to drop on the ground. My first 90 truffles were in temper. Then I began to lose the temper and you could see it in the streaky chocolate coating. Some of my truffles had cracked, probably because they were too cold. My pastry chef had told us to double coat truffles, which I did for about 1/3 of them. If you double coat, you need to let the first coat dry and harden completely before enrobing a second time. I had already decided to luster dust my truffles for some color, but I also realized that luster dust is a semi-effective way to hide bad temper chocolate. Sort of. I chose the raspberry luster dust, although midnight blue would have been beautiful too, no? Just remember to apply the luster dust after the chocolate is *completely* dry. If you like to add the little lines of chocolate decoration on top, you need that chocolate to be in temper too. I pipe it out through a teeny hole in a disposable piping bag (parchment cones are *great* too). For the stripes, it looks best to sweep your piping tip past the truffle. A lot of beginners just squiggle back and forth on the truffle and it looks… not so good. Try it. You’ll see what I mean. It makes a bloody mess, but in the end you get a nice finished product. While enrobing is a lot of work, I have to say there is something especially lovely about them compared to rolled or dusted truffles. And that extra special something is conveyed to the recipients too. Fine chop the chocolate and place in a medium bowl. Heat the cream until it begins to boil. Remove from heat and pour the cream over the chocolate. Let sit for a minute (make sure all chocolate is covered by the cream). 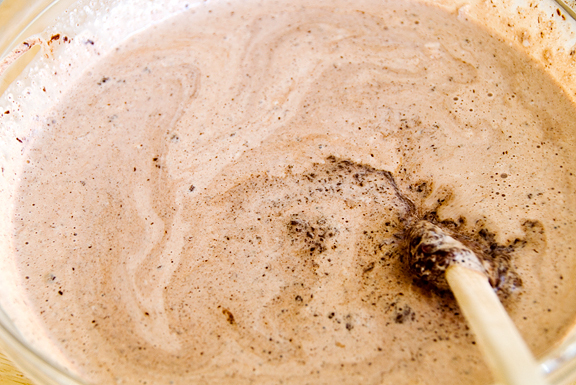 Stir the chocolate and cream together until velvety and smooth. Stir in Grand Marnier. Let the ganache cool until solid. Scoop out teaspoon-size balls of ganache and roll into a ball. Roll in cocoa powder, powdered sugar, nuts, crushed candy, or enrobe in tempered chocolate (if enrobing, you will want a pound of chocolate for the tempering and double enrobing may be necessary if cracking occurs on the first shell). I also like this method. Wow, what a palaver! They do look amazing compared to my lumpy messes that I usually give out this time of year! You’ve inspired me to try and have a go at tempering if I have the time. Thanks! Those look amazing. Truly. Amazing. I love me some truffles! Do you have any tips on packaging—like where you get those nifty little paper truffle holders? :) What a difference packaging makes in turning something into an impressive gift! Wow, you preparation and precision in truffle-making is so incredible! And who would have known that a makeup brush would come in handy for food! 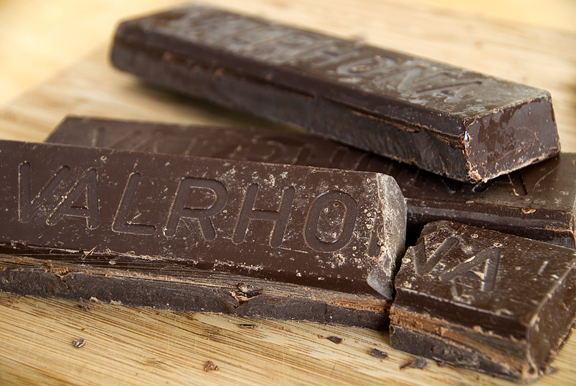 I think I may need to also have an emergency stash of Valrhona in my house–not for cooking, but eating. If it’s any consolation, these look more than worth the effort!! They are so beautiful on their own and look great in your little packaging. Gorgeous. And yet – I think I’ll be making dusty truffles out of the chocolate and cream I just bought. I can just imagine the cursing if I tried to temper/dip/place/double-dip/squiggle/temper/wrangle baby/avoid lurking dogs/talk to husband/listen to radio/drink tea. You’ll say: you don’t need to do half that stuff! And you’re right. But you know I would. So I’ll dust mine with cocoa powder and move on to the brown butter cookies. Those truffles are gorgeous!!! And your “i don’t” just made me feel really close to you :), i don’t nor have i ever owned a make up brush and sometimes it feels like i’m an endangered species. :) I have a pantry full of chocolate and was thinking of making truffles, too … i made them last year, but without the coating, and i’m thinking of advancing. :) Thank you for another wonderful post! Beautiful – I’m again impressed that you go to all that work. Great tip on the luster dust, since I don’t tend to have the patience to temper chocolate (successfully). I’m sure everyone those go to will be very happy to get them! You must be happy with the results. Your truffles look professional! Grand Marnier is the best (will go with the lovely Orangette candies you made yesterday. I’m impressed. Holy awesome, Jen, you are brilliant! I’m sure it was a pain to make all those, but you know, deep down, that you really enjoyed it! And it just looks so pretty! I love the luster dust!!! wow, these are gorgeous, and I can tell that you spent a lot of time on them. You are amazing! Gorgeous! My mouth is watering and I’m not even a chocolate person! I am in awe. 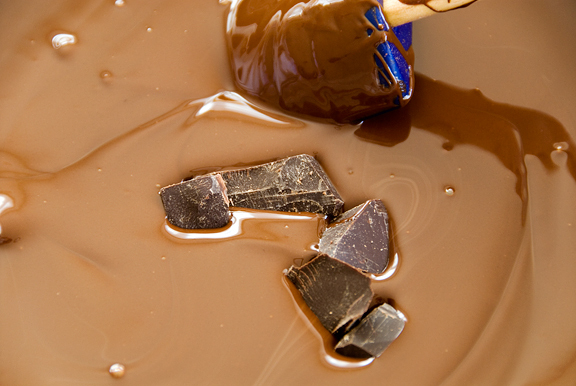 You temper chocolate like a pro. And that luster dust touch is icing on the cake. You are courageous! Those truffles look very pretty and professional! A great job! Fantastic. I just tempered chocolate yesterday afternoon to dip my chocolate covered cherries. I’m also about 50% on the tempering, I think I need to do bigger batches (I have this nifty little electric chocolate melter pot). I’m much better now that I bought a proper chocolate thermometer. What really makes me smile about your truffles is just how perfect they look. When I make them, and I think on every single food blog I’ve seen (even Deb’s – I swear you’re the Martha Stewart to her Julia Child, which I mean as a compliment to both of you), they’re misshapen blobs. And yet you make them perfectly spherical. They’re beautiful. I love your blog.Those truffles look just wonderful and out of the world….You made 180 truffles….god i cannt even think of making half of them…. you are one crazy chica, but check out the results! and lol: emergency supply of fine chocolate. 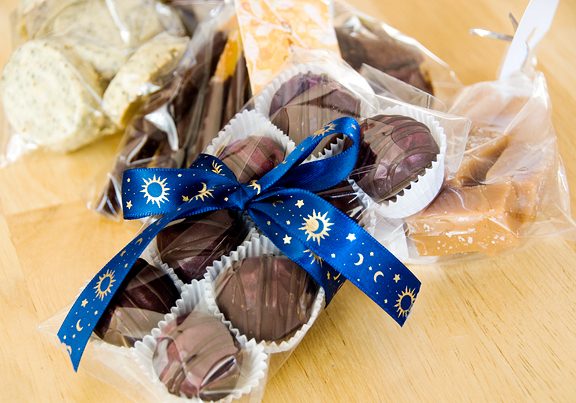 I used to make truffles when I worked in a candy shop years ago. They are such a pain to make but oh so worth it. Yours look beautiful and tasty. I love the raspberry luster dust. P.S. They are so beautiful! And yes, I really am green with envy. Throw something red upon me and call me, Christmas. Man you have balls! I mean chocolate balls………lots of them. I have some idea how much work goes into a project like this, only some, but its enough to send me running for the hills. Lucky the mouths that will be eating them…. Oooh! Those are so, so pretty! Really perfect, but such a lot of work. I’m so impressed! Totally worth all the effort. That Raspberry sparkly stuff looks awesome! Oh my gosh! They are SOOOOOO gorgeous! Do you mind if I add you to my blogroll? i love your blog! Let me give you my address………..
oh my gosh these are georgeous! I love the finishing touches! These are on my christmas cookie list only I’m not brave enough to mess with tempered chocolate! I gained my alloted 5 pounds of Holiday weight just by reading your blog. These are beautiful!! I love the luster dust in bright pink! I wish I had more time to add to my biscotti baking project, you are clearly inspiring me! Jen: you should become a pastry instructor. You have alot of talent for it. Love the dust of raspberry glitter. Every year I do my grandma’s truffles and I am so happy they don’t call for enrobing, actually she would have given the evil eye if I did! All the treats are scrumptious! WOW! I’m so impressed. I have had my own woes with tempering chocolate–in temper, out of temper, temperature drops, finding chocolate in random places in the kitchen weeks later, what a pain. I’ve pretty much given up on tempering chocolate and have even considered (for .25 seconds) buying a tempering machine. Your perseverance (and beautiful truffles) are an inspiration. 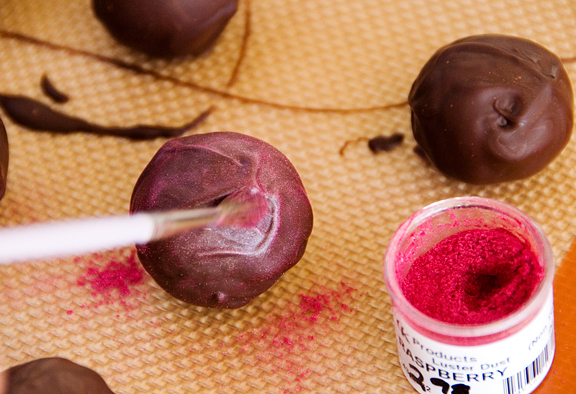 I’m sure your friends will appreciate the beautifully enrobed truffles you’ve made. Nice work! They are absolutely beautiful! And the packaging is gorgeous too! I’m sure the lucky, lucky, lucky recipients will enjoy them. I took a truffle making class while we lived in London and every year I am tempted to break out my molds to make them again. This, although it sounds like a TREMENDOUS amount of work, might be a tad less time consuming. You made them look extra gorgeous with the luster. I love how uniform and round they are. I find tempering chocolate to be one of the most maddening things possible in the kitchen. If I had a spare $400, I would buy a tempering machine. You make this look sooo easy! Crap, would have two chocolate covered dogs by the end of the day and that’s baaaaad! You’re killing us all here, wondering who the lucky folks are to get the goodies…. Look how pretty you made them. So lovely with the red luster dust. 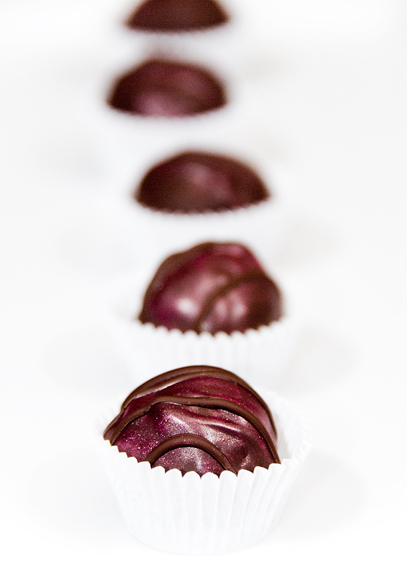 Your truffles look so beautiful–amazing! Nice packaging, too. You’re an artisan!!!! I will feel so warm and fuzzy if I’m the recipient! oooooh, now I want to do this! Those look great and really inspiring! We’ll see how things go, I’m taking two weeks off work for Christmas (the joys of having school aged children!) So maybe I can find the time to mess up my kitchen even more than usual!!! oh but how are they going to love these truffles. lucky recipients! Soo impressive and i love the bit where you say “Then I began to lose the temper ” I know i would seriously be loosing MY temper in a very unfestive fashion. these are gorgeous. i love the sparkle of the raspberry luster. the recipients of these are very lucky. jennywenny – thanks, and may the force be with you. Shannalee – I got those little candy papers from Michael’s. You can probably find them at any craft store or cooking supply store or upscale places like Williams-Sonoma. Amy – mmm, I saw your truffles. GORGEOUS. They sound so good too. I’ve only ever learned to temper chocolate from my pastry class. I always wonder if there is an easier (cheater) way to do it. Lezel – oooh, that’s quite the compliment! Thank you! Nate – ha! 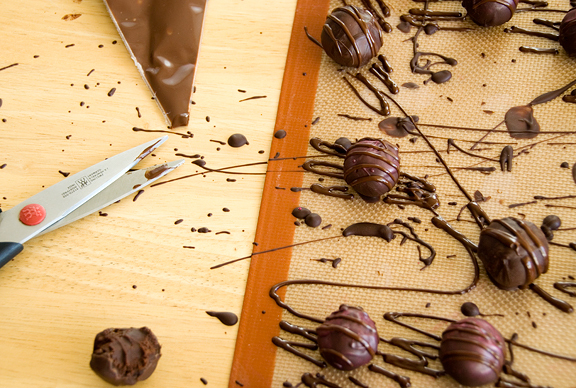 I *wish* I tempered chocolate like a pro – then I wouldn’t have so many rejects. Susy – yup, I found bigger batches helped tremendously. Bridget – you’re so sweet. There is something to be said for the handmade look though :) Then people don’t think you bought the stuff you’re giving out (I make sure to indicate these are handmade). Pam – thanks. You must be a pro! Helen – ooooh, I sincerely hope you’re better than me. I am just noodling around here! Susan – yeah, next time I make 180 truffles, please kick me in the shins, hon. Graeme – thank you, dear! Pearl – you’re welcome to add me to your blogroll (I really have no control over that, it’s your blog!). Denise – I love to play with luster dust and yet have so few occasions to. Elina – ha ha, thanks! Mark – yeah, you should be able to get gloves as a doctor. Easy peasy! yay!! 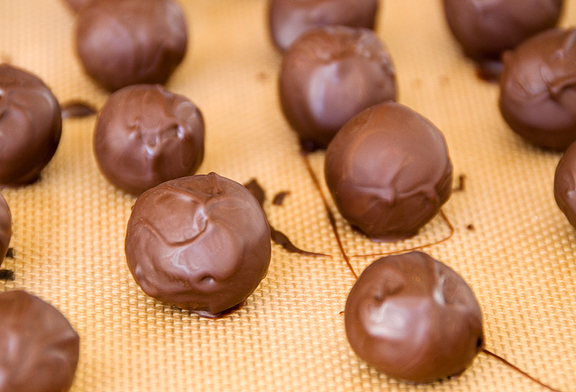 Dana – I am scared of molds, but probably because I’ve only made molded truffles once. We used the tempering machines in my class. I think they’re nice for holding the temperature steady, but I also think it might be possible to replicate that as long as my thermometer stops falling into the chocolate. Joanne – wow, two weeks! You go girl! Aran – thank you, dear. Monzie – they’re also very deserving :) Thanks! 1. you wrote you got 180 truffles using this amount of ingredients, didn’t you? maybe I’ll have to halve the amount of ingredients… I’ll also need fewer of them: around 90, though this is still too much…maybe even 30 is going to be fine…anyway, I’ll deal with this. 2. once you prepared the chocolates (already chocolate coated), where do you suggest I keep them? in the fridge? or at room temperture? for how much time? how long can I keep them before they run off? I’m also interested in finding out answers to Serena’s question above. I have far too many things to do for Christmas so was hoping to make these truffles a couple of days in advance. I was considering quartering the recipe too but wasn’t sure how it would take to that. Serena – *I had answered in email but forgot to post the answer here* i made 180 because i had made a mistake and used 2 pounds of chocolate and 2 cups of heavy cream. 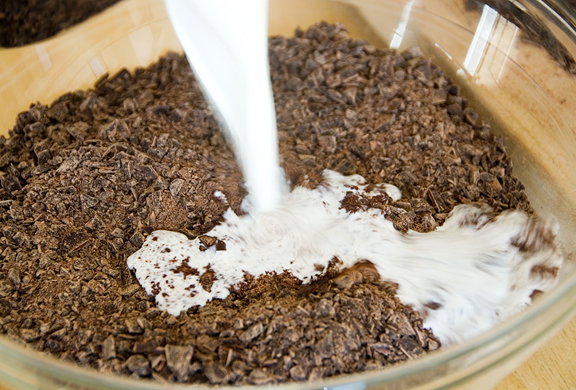 you can make approximately 90 truffles from 1 pound (16 oz) of chocolate and 1 cup (8 oz) of cream. after you are done, it is best to store the truffles in a cool room – around 65 F or 18C. I think they should last at least a week, if they are properly tempered, probably longer. Bria – the truffle recipe does fine for quartering or halving, etc. Just keep in mind if you plan to temper chocolate for enrobing that I don’t recommend tempering a quantity less than 1 pound of chocolate. ps: I have actually something more to ask you. Can I use the e-mail address you used to reply to my comment? Serena – absolutely. You can also find my email contact info on the “about” page. Kassandra – good luck! I hope you rock that recipe. Gearcheff – You can’t let the truffles get too warm or they will start to blob about. Ideally I think if they are at 65F then they’ll be solid. As for enrobing, when I dip the truffle, I shake out excess chocolate before setting it down to cool. Okay, well – Google is pretty handy for searching for recipes. I love this post! I read your blog all the time! I made these truffles for Christmas presents and they were a HIT! People have been raving ever since. I have made truffles before but I got some really good ideas and reminders from your post! what do you do with the scraps of chocolate on the silpat? lalala – it comes off the silpat easily and i save it in a bag to remelt later for things like chocolate mousse. Awesome. I have a big supply of wonderful bittersweet (85percent..love it) chocolate from German exchange students who know I love it dark, and I’m making these for my birthday today! Well, I will try. The rolled in cocoa ganache balls I’ve made dozens of times. Will try the tempered coating since feeling birthday brave. BTW, good blog. Many cooking blogs talk WAY too much about stuff that has NOTHING to do with subject at hand. Yours is about the recipe. Thanks. Hey Jen, Gale Gand does a truffle with Creme Fraiche or sour cream instead of cream in the Ganache. It adds an interesting tang and I wondered if you have tried that. I love your blog! Found it when googling candied orange peel recipes years ago and I eagerly open your updates every time. Sort of like a gift in my inbox!